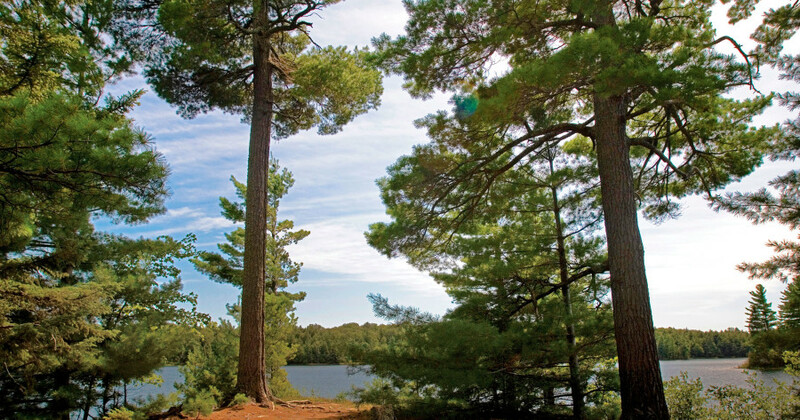 As the official state tree of Michigan, the white pine has a high standard to uphold in Northern Michigan’s outdoors. MyNorth contributor and Petoskey-based writer Russ Capaldi shares his admiration for the tree in the following essay, which was first featured in the June 2014 issue of Traverse, Northern Michigan’s Magazine. On a morning hike, the first meadow we come to has a single tree in the middle of it. The tree is a splendid specimen of white pine. We stop to admire it. The pine is tall and straight. The stem—what botanists call the trunk—tapers delicately and modestly to the top, while holding several massive limbs nearly parallel to the summer’s carpeted earth. The lowest of these is 50 feet above the ground! The tree wags its high green boughs in the higher, rarefied air, as if it would choke anywhere lower. Indeed, shattered limbs and lacerations dot the lower trunk, signs of long-past struggles. This towering pine tree was the first to catch the morning’s sun; its five-needled fascicles already warm and enriched. Green, six-inch cones dangle in the slant sunrays. On the lower trunk, still in the cool dim of morning twilight, the bark looks muddy, too regular. If we stayed until the sun rose to bask the entire meadow, the brightened bark would show all its exuberant detail in relief: long, feathered, grayish rectangular plates, one upon the other, like the folded and variegated wings of hundreds of moths. Scrambling madly over this lively surface are scores of black ants. Does our tree have a crown? Well it does, but not a globular one like a maple’s or oak’s. The white pine reminds me of a giant fern or palm; its crown composed of a number of leaf-shaped boughs. Each leaf-bough is independently subject to the gentlest breeze, but all of them acting together produces the most magical concordance—the sweet whispering strains of our beloved white pine. Other times, at evening or on mornings like this, the billowy boughs look like low, soft green clouds, underlit by gleam of sun . . . resembling one of Homer’s uncluttered scenes. Pinus Strobus. Eastern White Pine. When the English approached the eastern seaboard of North America for the very first time their eyes must have bugged right out of their heads. For from the virgin forests, staring out at them as they bobbed and heaved on the New World waters were—by the millions—what the world’s greatest navy was then in very short supply of: ship masts, and by extension, mast pines. By definition, white pine trees: at least 120 feet in length, four feet in diameter at the base, and two and a half feet in diameter at the tall mark. If a particular tree was qualified, three quick axe strokes at eye level left the king’s mark of immediate title: the King’s Broad Arrow. The British built two ships that could transport 50 stems at a time. How many white pines were taken from the colonies? Records are unclear. But the de facto seizures so rankled the colonists, it became their habit to chop down and make off with every King’s pine they came across; pines shoulder-to-shoulder with stamps and tea for revolution. Walking farther into the woods, we’re surprised to see now and then a giant white pine left to itself and dwarfing every tree around. We see them on the edge of the sparkling stream or on a bare promontory, and we’re pleased to wonder: did old-time timber men and prospectors leave these trees standing as some mark of reverence, or simply as cynosures to the next stand. Every Michigan citizen knows the white pine is our state tree. It is the state tree of Maine too. I think it is remarkable that no other state that occupies a position in the white pine’s original range chose it for a state tree. Not Massachusetts, New Hampshire, or Pennsylvania. Not New York or Minnesota. And on I75 the stump fields that flank the drivers speeding through Michigan’s northern heart show the true extent of its late 19th century harvest. So why did Michigan decide to honor the white pine? Did some wise legislature pay homage to the white pine after finding a small helpless virgin stand tucked into a dark corner of their state? Or did they choose it as an emblem for the resolute kind of people that pioneered their state. I sometimes think those juices still run in us. How many times, driving in Michigan and Maine, have I seen a tiny venture going forth under the immediate shade of a large white pine. Whether a garage mechanic, an ice cream shop, a lobsterman or lobsterwoman, a tiny motor inn, or a recent retiree’s brand new cottage … all have sunk their roots parallel to those of a great tree and unwittingly receive fragrant encouragement in their endeavor every single day.